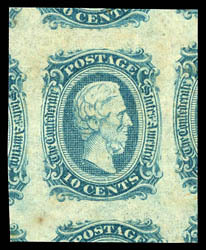 Confederacy, 1863, 10¢ blue, huge jumbo showing parts of all eight adjacent stamps, strong color and impression, o.g., never hinged, natural gum creases and toned spot at lower right extreme margin, an Extremely Fine jumbo; with 2017 P.S.E. 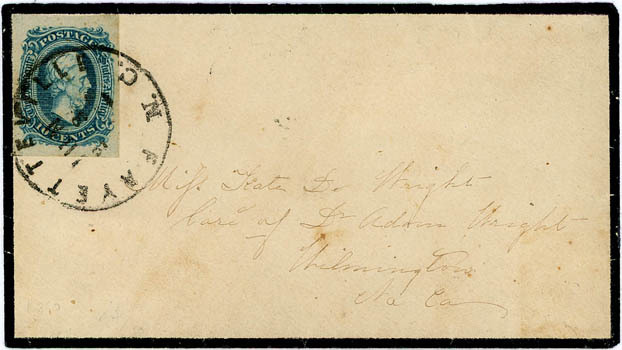 certificate graded VF-XF 85J. Scott No. 11 Estimate $200 - 300. Confederacy, 1863, 10¢ blue, complete pane of 100, bottom Keatinge & Ball imprint and plate no. 2 selvage, o.g., mostly never hinged, typical dark brown gum and some toning, creasing along top row and small edge flaws, F.-V.F. and scarce complete pane. Scott No. 11 $2,125 as blocks of four. Confederacy, 1863, 10¢ blue, large even margins with sharp impression, tied by neat strike of "Chester C.H. S.C. Dec 10" cds on red, green and white geometric wallpaper cover to Abbeville C.H. S.C.; opened for display, some minor restoration where split along flap at bottom, Extremely Fine, ex-Kohn, Boshwit; signed Dietz. Scott No. 11 Estimate $1,000 - 1,500. A GORGEOUS WALLPAPER COVER WITH GREAT EYE APPEAL. 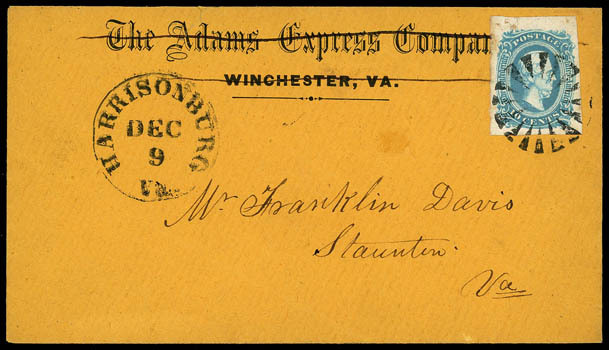 Confederacy, 1863, 10¢ blue, large to huge margins, spectacular bright color and proof-like impression, tied by Circle of 16-Wedges fancy cancel, matching "Harrisonburg Va. Dec. 9" cds on circa 1863 orange buff cover to Staunton Va. with "The Adams Express Company, Winchester, Va." imprint neatly crossed out in pen before mailing; tiny piece of backflap missing, Extremely Fine, ex-Antrim, Brandon. 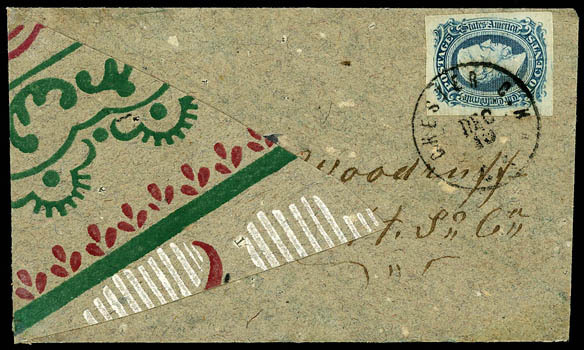 AN EXCEPTIONAL USE WITH A BEAUTIFUL STAMP, SCARCE FANCY CANCEL AND UNUSUAL ENVELOPE. 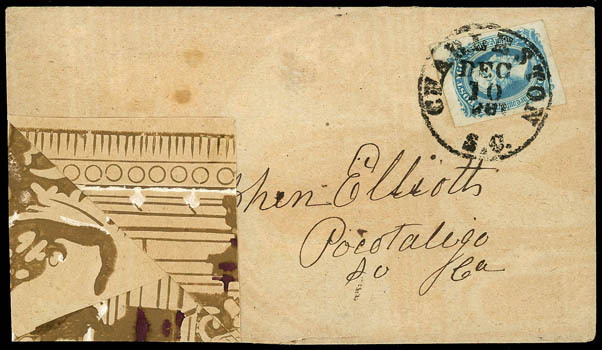 Confederacy, 1863, 10¢ blue, large even margins, tied by bold "Charleston S.C., Dec 10" cds on brown, white and purple landscape scene wallpaper cover to Pocotaglio S.C.; opened for display, Extremely Fine, ex-Dietz, Boshwit. Scott No. 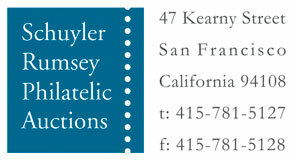 11 Estimate $750 - 1,000. 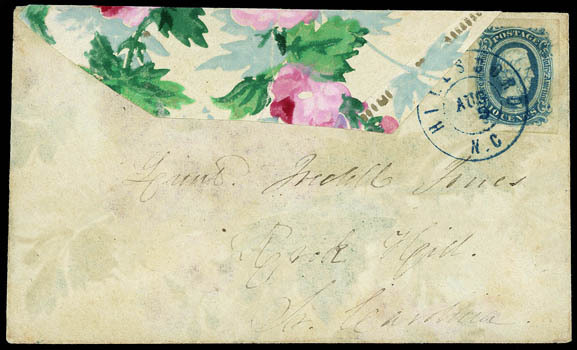 Confederacy, 1863, 10¢ blue, large margins, light creases, tied by blue "Hillsboro N.C. Aug 9" double-circle datestamp on pink, red, green and aqua floral wallpaper cover to Rock Hill S.C., opened for display, Very Fine and attractive wallpaper cover, ex-Boshwit. 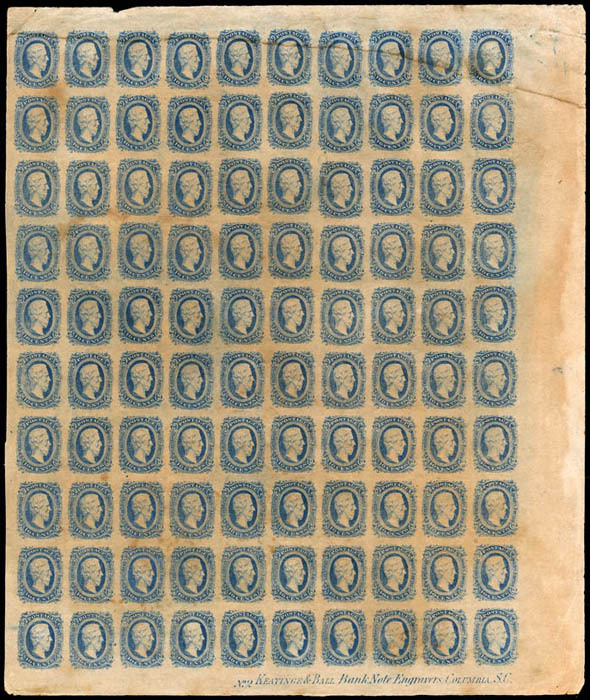 Confederacy, 1863, 10¢ blue, two four margin singles, each tied by blue "Columbia S.C., Aug 11" cds and part of addressing on gray, green, brown and orange wallpaper cover to Flat Rock N.C., Very Fine and choice. 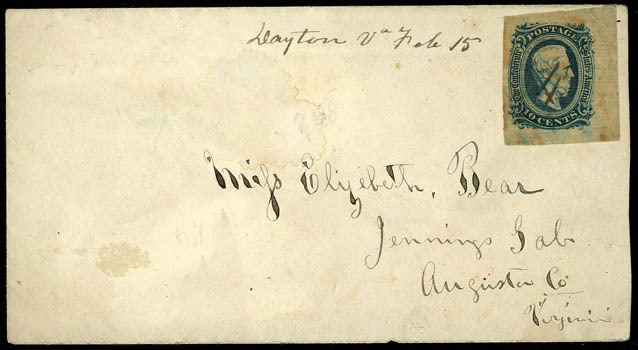 Confederacy, 1863, 10¢ blue, four large margins, strong impression, tied by bold "Fayetteville N.C., Jun 28" cds on mourning cover addressed to Miss Kate L. Wright, care of Dr. Adam Wright, Wilmington N.C., Very Fine and lovely small mourning cover, ex-Werner, Green and Morgan. Scott No. 11 Estimate $300 - 400. 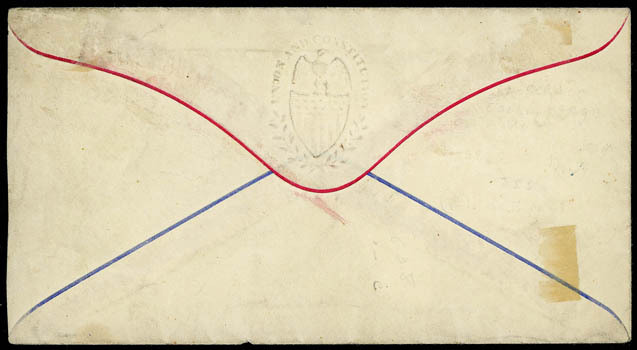 Confederacy, 1863, 10¢ blue, corner margin single with large margins, manuscript cancelled on captured Union Patriotic cover with embossed Eagle & Shield on backflap with red & blue piping along flap edges, matching "Dayton, Va., Feb 15" postmark (1865) alongside; faint stain, Very Fine. 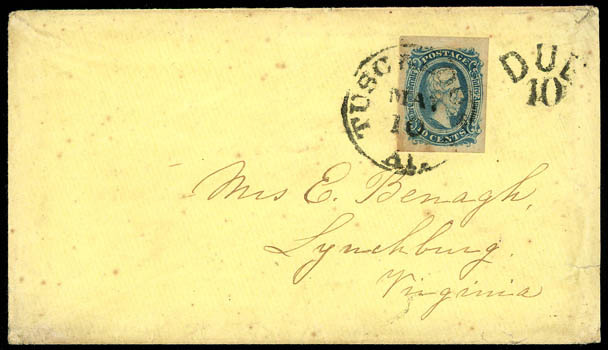 Confederacy, 1863, 10¢ blue, large margins, tied by "Tuscaloosa, Ala., May 10" cds on cover to Lynchburg, Va., with matching "Due 10" handstamp alongside, Very Fine, a scarce partial paid double rate usage.